Well, here’s something I didn’t see coming: I’m now doing speech therapy for Vietnamese patients. How strange is that? 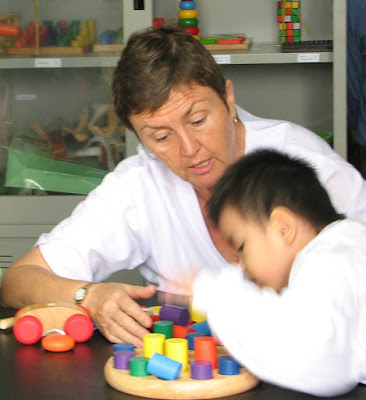 I’m not an Occupational Therapist, but I play one in Vietnam. Now, it appears that, by default, I’m playing Speech Therapist as well. Weird, when you think about it, especially since I can barely pull together enough Vietnamese to order banana pancakes and tea in the morning! More prosperous countries have highly trained, experienced physical, occupational and speech therapists. Here, in Central Vietnam, minimally qualified PTs are the only therapists patients will ever see. There just aren’t any OTs or speech therapists here. Lately, I’ve been luring therapists and patients away from the high, narrow treatment tables of the crowded “PT” area of the hospital and into the newly provided “OT” room in order to get them to try more functional upper extremity activities. There, we work on hand-eye coordination, trunk stability, combination hand-and-arm movements, and bilateral upper extremity function. Having a cabinet full of donated wooden puzzles has allowed us to see that some of the non-verbal patients have pretty sophisticated problem-solving abilities. We’ve also uncovered previously undetected visual and perceptual deficits in this setting. We check patients’ ability to follow verbal commands versus visual demonstrations. Today we experimented with one-step and two-step commands to look into memory issues. And we asked some patients to verbalize about their activities--what color is this?—and so forth. I couldn’t do any of this, of course, without Mieng, my trusty translator. This weekend, Mieng is stocking up on large-print and picture books, markers and notepaper. We’re going to see what we can do with a post-meningitis patient who, we now realize, has double vision and a stroke patient with right-sided paralysis who has word-finding issues and difficulty reading. I always urge my student therapists to take a functional approach when evaluating and treating their patients. But “activities of daily living” in Vietnam do not necessarily equate with ADLs in my former home country of America. Today, for example, I learned I’ve been operating under a mistaken assumption. I didn’t realize that most families in Vietnam sit and eat their meals on the floor. Many of our patients have difficulty feeding themselves in the hospital when they sit perched on the edge of their bed, without a table in front of them. I thought that issue would be resolved once they returned home, as long as the family ensured that they sat in a chair at the family table. Not necessarily true, if there’s no table or chair at home, eh? Earlier, I was stunned when a right-handed woman with a paralyzed left arm told me that she could not eat rice. I thought, at the time, that I’d resolved that issue by instructing her to set the bowl on a table with a little piece of rubber mesh under it to prevent it from sliding around while she scooped up rice using a spoon in her good right hand. Now I realize that she probably never eats at a table at all.